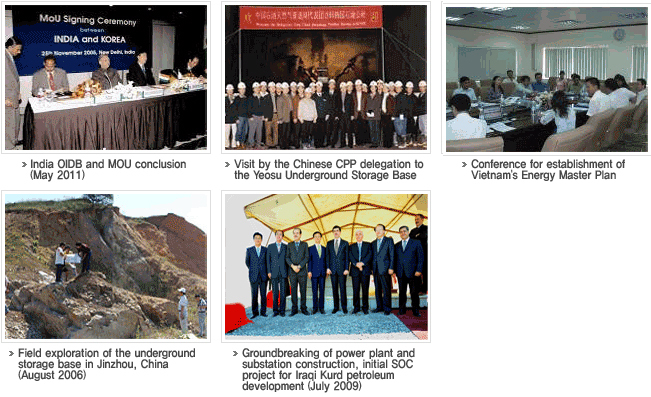 In contrast to northern Europe etc., which completed construction of storage bases at the end of the 70s, Korea has been unique in both building and operating underground storage bases simultaneously since the 1980s. Korea has the world’s most advanced technology in this area. Based on its accumulated technology and experience, KNOC is pursuing joint projects in cooperation with domestic private businesses to realize overseas strategic petroleum storage business for markets like China and India, with rapid economic growth and rapidly increasing petroleum demand. KNOC’s technological capabilities have been proven on the world stage, and have contributed to the development of the national economy through promotion of overseas entry of domestic private businesses.